Librarians are great at making rules. Maybe it’s in our blood or maybe it’s the nature of public service. Whatever it is, creating rules comes naturally to many of us. But don’t worry, this isn’t a post about how to make the rules, it’s about how to avoid them. We recently introduced a new digital media space at the Robert Morgade Library in Stuart, Florida. The idea lab includes tablets, laptops, and cameras that can be checked out; a flexible space that encourages collaboration; tech classes that go beyond our traditional computer classes; as well as three iMac computers and a flight simulator. With all this technology, you would expect to find people lining up, but we’ve actually noticed that our patrons seem intimidated by these new tools. In 2012 the first idea lab opened at the Peter & Julie Cummings Library, but the idea of a digital media lab at the library is still a relatively new service for our community. In order to welcome all of our patrons to the idea lab, we’ve lessened the barriers to access by having as few rules as possible. Here are a few of the risks we’ve taken. One of our biggest changes was reducing the amount of paperwork involved in checking out equipment. The original procedure called for a library card, picture ID, and a double-sided form in order to check out something as small as a pair of headphones. 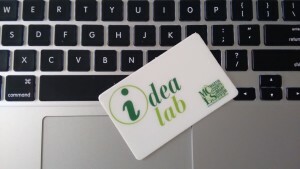 Now we offer an idea lab borrower’s card. 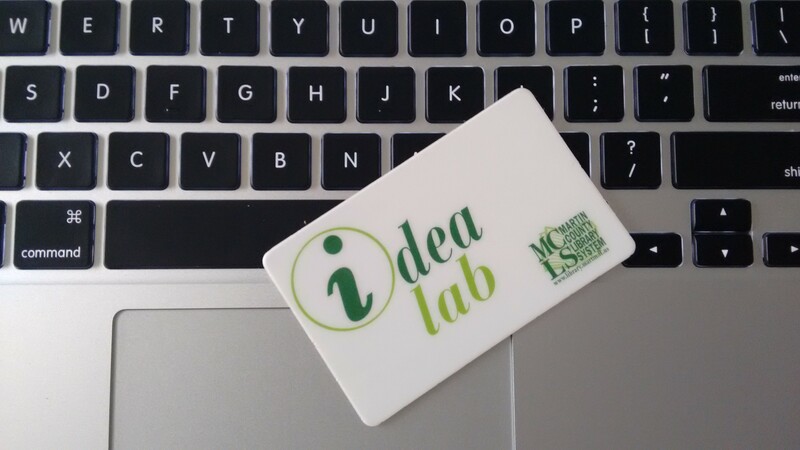 Signing up for an idea lab card is as easy as signing up for a regular library card. The only additional requirement is a one-time signature on a simple form where patrons accept responsibility for any equipment that they destroy. After the initial registration, all the patron needs is their idea lab card from that point forward. The result is less paperwork, less staff time, and more use. The flight simulator has been a completely new venture for the library and we’ve encountered a lot of unknowns in terms of policies and access, such as: Is there an age requirement? Should patrons have to complete a training session in order to use it? Do you need a library card? We looked to other libraries to see how to regulate this new service, but ultimately decided to start with as few barriers as possible. As it stands, anyone can walk up and try out the flight simulator. You don’t need a card, you don’t need a reservation, and you don’t need any previous experience or training. It’s been a month since our grand opening, with no fatal injuries or broken equipment, just a lot of people crashing and burning (only digitally, of course). We took another risk by choosing not to use Envisionware’s PC Reservation system for our iMac computers. The 20 public PC workstations at Morgade use PC Res and are generally booked, but we knew that our patrons would be hesitant to sit down at a Mac for the first time. Instead we opted for a low-tech solution: labels that read “Multimedia Priority Workstation.” We welcome anyone to try our iMacs, with the understanding that video editing trumps checking your email. I actually stole this idea from my alma mater. I figured if college freshman could handle it, the general public probably could too. We’re incredibly lucky to be offering these services to our community and always looking for better ways to share and teach technology. Over time we might have to step back and make some rules, but for now we’re in a good place. If your library is considering offering similar services, I highly recommend starting with as few rules as possible. And I can’t wrap this up without acknowledging my supervisor, who has helped create an environment where it’s okay to challenge the rules. I hope that you have like-minded folks on your team as well. Original Content, Top Technology Trends digital media, flight simulator, iMac, makerspace. permalink.